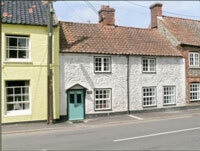 This page lists self-catering holidaycottages in Burnham Market and surrounding villages. Burnham Market has a village ambience with a surprising range of independent shops, and is only a few miles from the Norfolk Coast. Ideal for large families and groups, every bedroom in this large well-equipped holiday property has an en-suite bathroom. Spacious living room with wood-burning stove. Large conservatory/sitting room with TV. Spacious dining room with tiled floor, leading to children’s retreat. Spacious kitchen with Aga and breakfast area. The house is only a few minutes’ drive from the Norfolk coast. On the edge of Burnham Market only a five-minute drive from the coast. The cottage has a large living room with an electric woodburner, conservatory, enclosed back garden and patio. Single-storey holiday cottage with its own small, enclosed garden with patio, picnic bench and shingle garden. It is only a short walk away from the centre of Burnham Market village. A detached single-storey cottage with a large, enclosed garden and lovely views over open countryside. Only 2.5 miles from Burnham Market and a 15 minute drive from the North Norfolk Coast. A comfortable and welcoming detached holiday cottage with an enclosed back garden in a quiet estate in Brancaster Staithe, just off the main coast road linking many of the charming seaside villages of Norfolk. One of the bedrooms has an ensuite bathroom, and there is also a family shower room and a second shower room on the ground floor. 3 miles from Burnham Market. This characterful 17th-century cottage is next door to the pub in the centre of North Creake village. It has wood beams downstairs and a woodburner in the living room. Only three miles from Burnham Market. This pretty beamed cottage has an enclosed garden and patio, and sweeping views over the countryside. It is on the edge of North Creake village about three miles from Burnham Market and five miles from the coast. An attractive nicely furnished cottage at the edge of South Creake village and five miles from Burnham Market.